Free Shipping Included! CMC Rescue 250205 Rappel Gloves Tan X-Large by CMC at Wildly World. MPN: 250205. Hurry! Limited time offer. Offer valid only while supplies last. Outstanding hand protection meets dexterity in our Rappel Gloves. Wear them to tie knots and work with hardware, set up a system or to rappel. Outstanding hand protection meets dexterity in our Rappel Gloves. Wear them to tie knots and work with hardware, set up a system or to rappel. Pittard's Armor-Tan leather and unique Kevlar® brand fiber stitching combine for unparalleled durability. 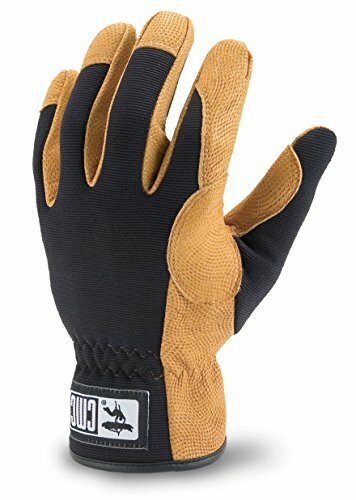 A double layer at the thumb web protects hands when rappelling, and the wear-resistant double palm guards against heat, moisture, cold, and abrasion. Its second anatomically segmented layer eases grip fatigue. The back is equally detailed: spandex ventilates and delivers flexibility and comfort, while elastic at the wrist provides a secure fit. When not in use, these gloves can hang on harness gear loops using the carabiner loops sewn into the wrist. Space on the label allows for user's name or initials. Working-At-Height / Industrial Rope Access / Technical Rope Rescue Working at height requires reliable, quality equipment. The Rappel Gloves can be used with confidence in work-at-height maneuvers for industrial rope access or technical rope rescue when used in accordance with the regulatory safety standards they fall under. Always use life safety equipment and gear according to the regulatory safety standards for which it is classified and/or certified.